Nothing screams “cute” to me like little baby goats! Of all my friends, they know that if someone shared a picture of baby goats wearing sweaters, it was most likely me. There is just something about baby goats that makes me so happy! Their cute little bleating, their strange square pupils, their willingness to hop instead of walk, and their adorable little tongues are just too much to handle! 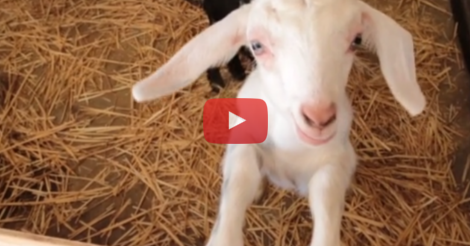 These goat siblings are just hanging out in their pen, but they are getting pretty antsy about it! It’s lunch time and they are so hungry! Mom comes out and starts talking to them, but they can’t understand human, so they just bleat and maaaah! She walks away to go get their milk, and the little white goat can’t contain herself! She’s bounding all over the cage and can’t handle all of this excitement!! Their little tails start wagging and this has just become the best day EVER! Raising goats must be a fun job. This woman looks like this is her favorite part of the day, too! Feeding time in any house is a jovial affair, so why shouldn’t be extra fun and exciting for these little goats? Too adorable!